Use these credits during trace attempts. Some IDs are good, so good in fact that they become the standard for almost every deck you might consider in that faction. This isn't one of those. There are also the IDs that are...unfortunate. The kind that people look at and think, "Man, I never realised I could feel sorry for a glowing 'W'". This isn't one of those either. Making News sits, in my opinion, squarely in the "Good if you want to [X]" category of IDs, with a more limited scope than some, but with definite use to be found. Its focus is also not so narrow that it largely dictates how to build your deck. Tracing is one of the more major mechanics in the game and so there is some flexibility in deciding how to make the most of that 2. While there are more efficient IDs for putting tags on someone (I hear some people are playing Controlling the Message from time to time), Making News increases the pressure from trace-based shenanigans in general, giving you the choice of when to make an effect more likely to stick or hit harder. Sadly in the Core Set you don't have many ways to take advantage of this. In fact most of the ways you can use your 2 are in aid of landing tags, which aremostly used for kicking off urban bonfires. SEA Source (and whatever nastiness follows it), forcing the runner to either run less or work harder to stay ahead on money. While in recent months bathing in cash hasn't exactly been hard for runners, if it's just you, a new Netrunner friend and their starter box, money can be pretty tight. Data Raven is often regarded as being pretty solid blocking ICE until the runner finds a breaker for it. Few people want to take the mandatory tag in the first place, but practically no-one wants to give the Corp the ability to tag them on their turn. The fact that it's Trace 3 is the only real 'weakness', and the 2 extra from Making News can make even a wealthy runner think twice about wading through it early on. Hunter's trace going up to 5 will often ensure that the runner takes the tag then clears it if they facecheck it. Same (to an extent) with Matrix Analyser. Essentially what Making News often boils down to is giving you a form of control on how you want to tax the runner early game, with them paying money to not get tagged or spending clicks to stay ahead on money. Flipping your 2 on a trace can usually lead them into choosing the one you prefer at that time. Of course, this doesn't ALWAYS work, and the value players place on time vs money varies from person to person. And sometimes you'll be playing against Kate, 3 Rabbit Holes and Access to Globalsec (just because there aren't a whole lot of alternatives), so this can keep your traces somewhat meaningful. Truth be told Making News is quite underwhelming in the Core Set, but it's by no means terrible, and should you start to include cards from later packs like the dreaded Midseason Replacements, Manhunt, Aryabhata Tech and so on, you'll find yourself with far more toys to give a little, sometimes decisive boost in increasingly interesting ways. 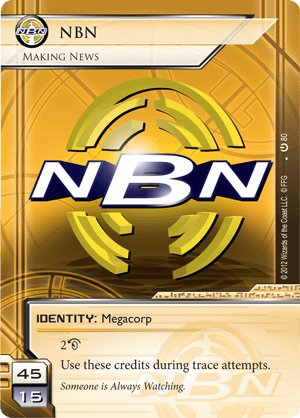 The least impactful of all the core set Identities, Making News started the Fast Advance train, but it quickly moved over to NBN: The World is Yours* for the smaller deck size (increasing the chance of getting the pieces needed) and larger hand size (holding more). The Trace bonus of Making News, while thematic to the strengths of NBN, simply did not help the Fast Advance strategy. As such, Making News rarely see’s play. Its ability can be very strong, given how many pieces of ICE and operations NBN carries that have a Trace effect, but the question is how is that Trace effect used to win the game? Too often when faced with a Trace either the corp will not boost it at all, making it (often) negligible for the runner to match, or the corp will boost it out of the runners reach, so the runner does not boost at all. There is a strategy that has not yet been explored however. Like the Jinteki shell game, one of bluffs and posturing. When a Trace is boosted a little, but not enough that blows the runner off from being able to match it, it can be a powerful bluff or an interesting tax. What does the runner do, match and beat the trace, spending valuable credits that might be needed on the next piece of ICE or let it fire and take the punishment for it? This strategy requires traces that have an effect the runner wishes to avoid; Either effects that are immediately dangerous, or tag punishment cards in hand such as Closed Accounts. Making News may see a resurgence with NBN Fast Advance seeing a setback. The other strengths of the faction may be explored, and if found to be competitive, Making News could certainly see a comeback.